This latest instalment of Rhythm Incursions’ â€œIn Sessionâ€ series is a tribute to the art of preservation and mixtape culture. During the process of digitally restoring and preserving tapes for my forthcoming early works project â€œMood Algorithmsâ€ I decided to also digitize some mixtapes from the same period to share with you. 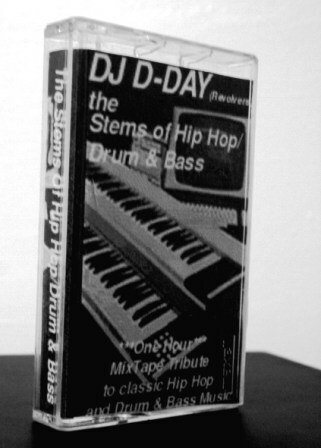 â€œStems of Hip Hopâ€ was created circa 99/00 (pre internet download era) with a turntable, mixer, tons of vinyl and a four-track as a tribute to advancements in experimental hip hop music and drum and bass that spawned from the pioneering days of hip-hop production and sampling. The original physical tape was available throughout Los Angeles at spots like Fat Beats (Hollywood), Beat Non Stop (Melrose) and also at shows as well as circulated/dubbed amongst friends. In an effort to continue the process of sharing this work I’ve digitized it and am putting it out as part of my “In Session” series. So please download and share… spread worldwide! As with the last In Session episode the podcast is available to all our subscribers via our RSS/iTunes feeds – if you aren’t signed up yet you’ll find the links below. The usual direct download link is replaced by a Bandcamp one – simply click through to download the podcast directly via Bandcamp. This entry was posted on Monday, October 24th, 2011 at 2:20 pm. It is filed under Podcasts, DDay One - In Session series and tagged with Dday One, DDay One - In Session series. You can follow any responses to this entry through the RSS 2.0 feed.